Ireland has more to offer than Sea Stacks - there’s superb crags across the country. David Flanagan’s “Rock Climbing in Ireland” helps you plan your trip to the Emerald Isle - which has climbing on half a dozen types of rock to offer, at sea cliffs, in the mountains and beautiful crags! Fellow climbers will easily be able to relate - get a new guide book into your hands and immediately you start thinking about a trip to the area the book presents. While I just returned from Ireland a couple of weeks ago browsing Rock Climbing in Ireland has me thinking about when I could again visit the island for some climbing - and plenty of awesome climbing there is in Ireland. 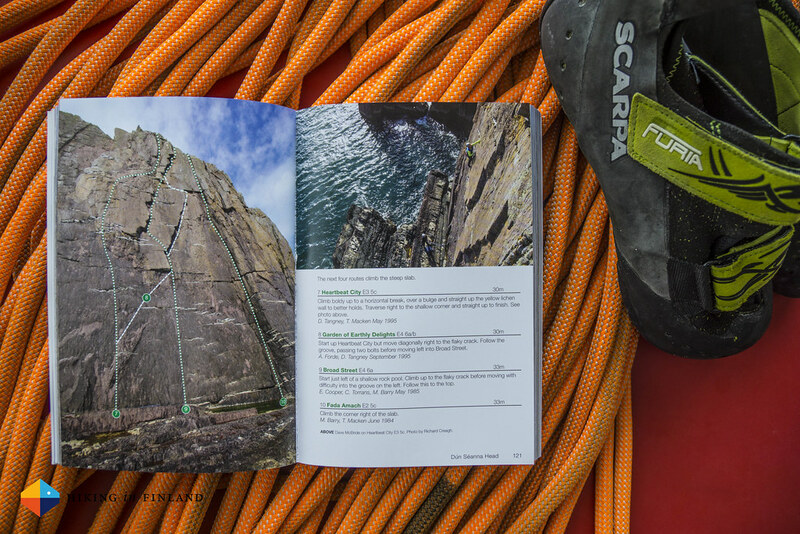 The book starts of with the basics you need to know about climbing in Ireland - Access and Conservation, Equipment, When to Visit, Accommodation and how to get around the island. A Crag Table lists all 22 crags and what sorts of routes you will find there, and then right away dives in with describing the different crags. These include a introduction, tips on accommodation in the area, what you could do on rainy or rest days, conditions and directions to the crag. A large overview photo often shows the crag and the different sectors, and a small, basic overview map helps with navigating. The Topos and Route descriptions are coming with good details and some great photos of the climbs will get you in the mood for a route. And finally, a Route Index at the end of the book lets you find a route quickly. I loved the clean, minimalistic and well-structured layout of the Guidebook. 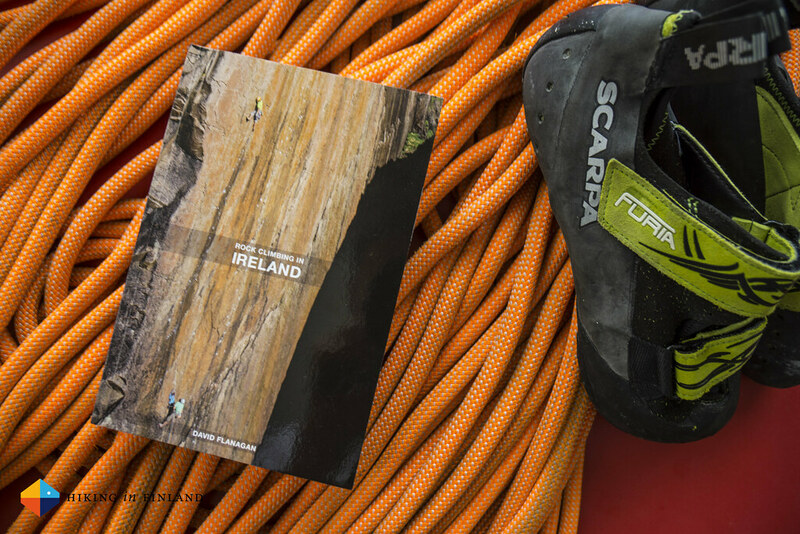 It was aesthetically very pleasing to read, with a nice & clear typography and great topo photos - these are something that make a climbing guide book not merely good, but great. What I missed was that some crags didn’t have information on accommodation and rainy & rest days tips, I think for many people visiting from abroad it would help to have a recommendation for where to stay and what to do when the weather is shite. This is my only complaint (and something you can find out yourself with the help of an online search), and overall I would highly recommend this book to anyone who is planning to go rock climbing in Ireland. The beautiful guide book will make you look forward to visiting this beautiful island with the fair weather and gives you with over 400 routes in it more than enough inspiration of where to go & what to climb! Buy Rock Climbing in Ireland at your local book store or climbing gym, order it directly from the author at Three Rock Books, or your local taste of Amazon.com, Amazon.co.uk or Amazon.de.